Two armed men robbed an Oceanside pizza parlor and then forced an employee to drive them roughly 10 miles to Bonsall early Friday morning. 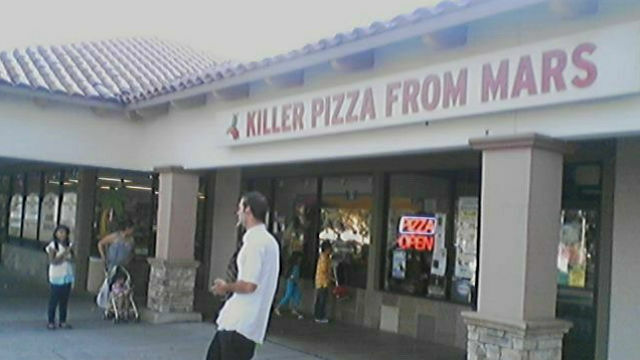 Officers were alerted just after midnight by the victim, an employee at Killer Pizza from Mars, Oceanside Police Lt. Kedrick Sadler said. The restaurant at 3772 Mission Ave. is just across the street from the Oceanside Police Department. The suspects, one apparently armed with a handgun and the other with a knife, made contact with the employee while he was cleaning the restaurant Thursday night and forced him to give them cash, OPD spokesman Tom Bussey said. The suspects then forced the employee into a vehicle. After forcing the victim into the car, the suspects made him drive them to Bonsall, about 10 miles northeast of Oceanside, where they fled from the vehicle, Bussey said. It wasn’t believed that the victim was injured. Detectives were investigating the incident and did not immediately provide suspect descriptions.